Back from lovely Lille – more of which later in the week – and it’s time for my favourite meme. Six Degrees of Separation is hosted by Kate over at Books Are My Favourite and Best. It works like this: each month, a book is chosen as a starting point and linked to six other books to form a chain. A book doesn’t need to be connected to all the others on the list, only to the one next to it in the chain. This month we’re starting with Chloe Hooper’s The Arsonist which I haven’t read but which I know from Kate’s review is about an appalling conflagration which took place in Australia in 2009 and the man who set some of the fires which contributed to it. For obvious reasons my first link is to Sue Miller’s The Arsonist about the burning down of summer houses in a small New Hampshire town. One of the characters in Miller’s novel is called Frankie which leads me to Barbara Trapido’s Frankie and Stankie whose main protagonist flees South Africa’s apartheid regime in the ‘60s to live in the UK. South Africa shares a border with Zimbabwe, the setting for Petina Gappah’s The Book of Memory in which the eponymous narrator tells her story from death row, imprisoned for the murder of the white man she’s been living with since she was nine. Edgeworth Bess shares a similar predicament, telling her story via Billy Archer as she awaits sentencing for the possession of stolen goods in The Fatal Tree, Jake Arnott’s rollicking tale of eighteenth-century thieves and whores. In Emily Woof’s The Lightning Tree a girl from one side of the tracks – comfy, middle-class, leftie activist parents – meet a boy from the other side – council estate, working-class, Thatcherite mum and dad – they fall in love, the girl heads off to India, the boy to Oxford and then we see what happens, following them into their thirties. Emily Woof is an actor, a profession she shares with Michèle Forbes who wrote Ghost Moth, set in Northern Ireland, which tells the story of a marriage in alternating narratives, twenty years apart. This month’s Six Degrees of Separation has taken me from an investigation of a devastating fire in Australia to a Northern Irish love story, and this time I’ve read all but our starting point. Part of the fun of this meme is comparing the very different routes other bloggers take from each month’s starting point. If you’re interested, you can follow it on Twitter with the hashtag #6Degrees, check out the links over at Kate’s blog or perhaps even join in. This entry was posted in Random thoughts, Reviews, Six Degrees of Separation and tagged Barbara Trapido, Chloe Hooper, Emily Woof, Frankie and Stankie, Ghost Moth, Jake Arnott, Michèle Forbes, Petina Gappah, Six Degrees of Separation, Sue Miller, The Arsonist, The Book of Memory, The Fatal Tree, The Lightning Tree on 4 March 2019 by Susan Osborne. I’ve been in dire need of distraction this year. I tend to keep politics out of this blog but ours is a very political household. It’s what we talk about over supper but this year we both decided, for the sake of our mental health, we needed to rein it back. Books, as ever, have been a solace. Far too many favourites for one or even two posts so there will be four, all with links to full reviews on this blog. January began with a book that was published in the previous December and as a result may not have made the impression it deserved which is why it’s popped up two weeks running here. Jennifer Down’s Our Magic Hour follows twenty-four-year-old Audrey for just over a year after her best friend kills herself, exploring the devastation of grief and loss through a group of young people, suddenly made aware of their own vulnerability. Written from Audrey’s point of view, Down’s debut is a masterclass in elegant understatement steered neatly away from the maudlin. It’s about the way in which friendship can help you through the darkest of times, about resilience and learning when to reach out, and it ends on a note of hope which brought me to tears. A very fine novel indeed – compassionate, clear-sighted and lovely. Nathan Hill’s The Nix is a big novel in every sense of the word. Through the story of a mother and the son she left when he was eleven, it explores the panorama of American life from the heady idealism of the ‘60s to 2011, the world still reeling from the global financial crisis. The writing is striking from the get-go and it’s very funny: Hill hurls well-aimed barbs at all manner of things from social media to advertising, publishing to academia to mention but a few. Careful plotting ensures that each piece of the puzzle slots neatly into place until both Faye and Samuel’s stories are told. It ends with fresh starts, a much-needed reminder that despite all that’s gone before there will always be both redemption and hope somewhere in the world, albeit personal rather than political. Addison Jones’ Wait for Me, Jack comes packaged in the perfect jacket. It’s the story of a marriage spanning sixty years, contracted in 1952: Jack is about to playfully pull the laughing Milly into what they hope will be the nice warm swimming pool of married life. In many ways they’re an ill-matched couple, neither of them quite what the other expected or thought they were, but they stick it out, always finding some love left no matter how close they are to the bottom of the barrel. Jones’ narrative is a little fragmented in the way that memories are but it’s all beautifully done, anchored by recurring motifs. An engrossing, utterly gripping novel, beautifully bookended by the repetition of Jack and Milly’s first meeting. February also delivered three novels that hit the spot, each very different from the others, starting with Jacqueline Woodson’s Another Brooklyn. This elegant novella is a book of memory, the story of a teenage girl in the ‘70s which unfolds when a chance meeting after her father’s funeral catapults August back into her past. It’s a gorgeous book – deeply moving, peopled with vividly drawn characters and beautifully expressed. Woodson is known for her young adult and children’s books but I hope she’ll find time to write some more for us grown-up readers. Comprising eight stories written over a period of twenty years, The Refugees is by an author who fled with his parents from Vietnam to America in 1975. It explores the consequences of leaving one’s country under the most difficult of circumstances, consequences which continue to echo down the generations. Viet Thanh Nguyen considers themes of memory, love, family, identity and belonging – or not belonging – from a variety of points of view in a collection which combines a thoughtful distance with first-hand experience lending it a quiet power. Every refugee – from Vietnam, the Balkans, Iraq, Afghanistan, Syria or any of the many conflicts that afflict our world – has their story which will continue to reverberate for many decades. At which point you may be wondering about books as a distraction from politics but my next February choice has that in spades. Jake Arnott’s The Fatal Tree is a rip-roaring tale of thieves and whores, love and folly, corruption and redemption, much of it told in flash – gloriously vivid eighteenth-century thieves’ slang. It’s the story of Edgeworth Bess who is in Newgate Gaol, awaiting trial for possession of stolen goods which may well lead her to Tyburn’s gallows. Alongside Bess’ tale, Billy – petty thief, scribbler and molly – tells his own, intertwining his narrative with hers as each moves towards a decisive conclusion. I have a feeling that Arnott had a great deal of fun writing this book, delving into the lives of spruce-prigs, twangs and buttock-brokers. This entry was posted in Random thoughts, Reviews and tagged Addison Jones, Another Brooklyn, Books of the Year 2017, Jacqeline Woodson, Jake Arnott, Jennifer Down, Nathan Hill, Our Magic Hour, The Fatal Tree, The Nix, The Refugees, Viet Thanh Nguyen, Wait for Me JAck on 4 December 2017 by Susan Osborne. There’s an abundance of paperback treats coming up this September, so many that I’ve split them into two posts. Top of my list is Jake Arnott’s rollicking tale of thieves and whores, The Fatal Tree, set in 1726. Told to us by Billy, a confessional writer with his own story, it’s about Edgeworth Bess, banged up in Newgate Gaol awaiting trial for possession of stolen goods which may well lead her to Tyburn’s gallows. Replete with period detail, salaciousness and vivid descriptions, Arnott’s novel is both nicely taut and very funny at times. A wonderful piece of historical storytelling as atmospheric as Michel Faber’s The Crimson and the White. Nathan Hill’s The Nix is an entirely different kettle of fish, although parts of it are set in 1968, certainly classed by my contemporary historian partner as history. Samuel is an assistant professor in his mid-thirties when the story of the Packer Attacker breaks: a woman in her sixties is facing prosecution for throwing stones at the Governor of Illinois. The woman turns out to be Samuel’s mother who left the family home when he was just eleven. Hill takes Samuel and Faye’s stories from the heady liberalism of the ‘60s to 2011, the world still reeling from the global financial crisis. Riveting stuff for me, full of striking writing and it’s very funny, too: Hill hurls well-aimed barbs at all manner of things from social media to advertising, publishing to academia – the latter spot-on according to H – to mention but a few. Michael Chabon’s Moonglow also takes a long hard look at American history by the sound of it, drawing on stories told to him by his grandfather. The novel takes the form of a deathbed confession in which an old man tells his grandson stories long-buried, revealing a life far more adventurous than the grandson could ever have expected. ‘From the Jewish slums of pre-war Philadelphia to the invasion of Germany, from a Florida retirement village to the penal utopia of a New York prison, from the heyday of the space programme to the twilight of ‘the American Century’, Moonglow collapses an era into a single life and a lifetime into a single week’ say the publishers. Given Chabon’s storytelling skills this should be unmissable. The next three titles are on a much more domestic scale beginning with Karl Geary’s Montpelier Parade described by the publishers as ‘luminous and moving’. Set in Dublin, it’s about Sonny who falls for Vera, both of them from very different backgrounds. ‘Unfolding in the sea-bright, rain-soaked Dublin of early spring, Montpelier Parade is a beautiful, cinematic novel about desire, longing, grief, hope and the things that remain unspoken’ say the publishers which sounds very appealing. Gwendoline Riley’s Baileys Prize shortlisted First Love could be described as exploring similar territory although the relationship between Neve and Edwyn may not seem like love to everyone. Neve is a writer, working at home and living with Edwyn who is much older than her, often cranky and unpredictable. As we learn more about Neve’s life we begin to understand why she puts up with the stream of insults hurled at her. Riley leavens her spare, pin-point sharp novella’s bleakness with spikes of humour. Unsettling and thought-provoking, it ends on a note of frail hope. This entry was posted in Random thoughts, Reviews and tagged English Animals, First Love, Gwendoline Riley, Jake Arnott, Karl Geary, Laura Kaye, Michael Chabon, Montpelier Parade, Moonglow, Nathan Hill, Paperbacks published in September 2017, The Fatal Tree, The Nix on 21 August 2017 by Susan Osborne. Jake Arnott was featured in a documentary on the trials and tribulations of getting your first novel published back in 1999. The Long Firm later became a bestseller, dramatized by the BBC several years later. I’ve often wondered how the other writers felt about this personable, camera-friendly literary star in the making whose success was contrasted with their increasingly desperate efforts as they waded their way through their well-thumbed copies of The Writers and Artists’ Yearbook looking for an agent. Arnott’s debut is the first of three novels set in the gangster world of the ’60s East End. Sadly, the other two didn’t quite match its brilliance although I’m pleased to say that his new novel, The Fatal Tree, is every bit as good. Narrated by five very different characters, The Long Firm follows the career of Harry Starks, a gangland boss with a weakness for stardom and a yearning for respectability. Each narrator tells the story of their dealings with Harry: Terry is Harry’s pretty suburban kept boy; Teddy is the corrupt peer who finds himself out of his league; Jack the Hat is a freelancer who flits dangerously between Harry and the Kray twins; Ruby is a fading Rank starlet and Lenny is a criminologist whose relationship with Harry leads him into the dark realities of the criminal underworld. Set in mid-60s London amidst enormous social change and written with a wit as sharp as the cut of a gangster’s suit, Arnott’s novel explores the dark underbelly of a period often recalled as vibrant and exciting, expertly blending fact and fiction in a vivid evocation of the times. Not only can Arnott write but my contemporary historian partner assures me that the period detail is spot-on – high praise indeed. This entry was posted in Blasts From the Past, Reviews and tagged East End 1960s Gangland, Jake Arnott, Sceptre Books, The Fatal Tree, The Long Firm on 26 June 2017 by Susan Osborne. 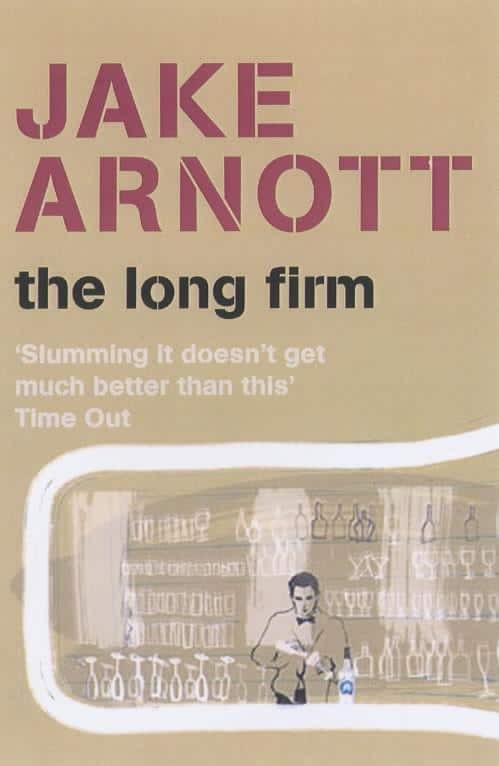 Jake Arnott’s first novel, The Long Firm, was published way back in 1999. I was a huge fan: he summoned up London’s underworld in prose as sharp as a ‘60s mobster’s suit, expertly blending fact with fiction. A hard act to follow, then, and sorry to say Arnott’s never quite matched it for me but I’ve stuck with him, ever hopeful, and The Fatal Tree proves that fidelity can win out. It’s a triumph – a rip-roaring tale of thieves and whores, love and folly, corruption and redemption, much of it told in flash, gloriously vivid eighteenth-century thieves’ slang. In 1726 Edgeworth Bess is in Newgate Gaol, awaiting trial for possession of stolen goods which may well lead her to Tyburn’s gallows. Billy Archer has petitioned Mr Applebee, a publisher of confessions popular at public hangings, to commission him to tell Bess’ story. Bess began life in the home of a noble family – the daughter of a servant, thrown out when she’s caught in bed with their son. With only the guinea he’s given her, she finds her way to London, easy meat for the city’s madams eager for fresh faces. Punk Alice saves her from the worst of them, installing her in Mother Breedlove’s bawdy academy where she learns how to please both the punters and herself. Smart and sassy, she’s soon at home amongst the denizens of Romeville, a buttock-and-file who whores and picks pockets, attracting the attention of both Jonathan Wild, self-proclaimed Thief-taker General, and Jack Sheppard, a carpenter’s apprentice who puts his skills to use as an expert burglar. Bess and Jack fall for each other hard. Jack’s strutting arrogance will trip him up badly but his jail-breaking skills will make him a legend while Bess will need her sharp-as-a-tack wits to get him and herself out of trouble, all under the gaze of Wild who holds Romeville in his grubby sway. Alongside Bess’ story, Billy – petty thief, scribbler and molly – tells his own, intertwining his narrative with hers as each moves towards a decisive conclusion. Arnott alternates Bess’ confession, told in her own words with Billy’s letters to Applebee. Written in flash, Bess’ sections will have you frequently diving into the glossary at first but, rather like The Wire, once you have your ear in, so to speak, her narrative is easy to follow. Arnott keeps the tension nicely taut with cliff-hangers and foreshadowing throughout, liberally lacing his story with both the salaciousness promised in Billy’s first letter and a fair dose of humour. The period detail is vivid, descriptions of the thieves’ dens nicely lurid, but Arnott takes care not to get too caught up in what has clearly been meticulous research, rounding out his characters so that they leap off the page. John Gay wanders through Billy’s narrative, a frequent acquaintance, keeping his ear to the ground. There are echoes of our own times both in the language – I think we’d all like to see ‘impeach’ in common use soon – and in the tidal wave of greed preceding the bursting of the South Sea Bubble. It’s a thoroughly enjoyable novel, a wonderful piece of historical storytelling as atmospheric as Michel Faber’s The Crimson and the White. I have a feeling that Arnott had a great deal of fun writing this book, delving into the lives of spruce-prigs, twangs and buttock-brokers. I can’t finish this without quoting a few more of my favourite flash expressions: gospel-shop a church; glaziers eyes; pot-valiant drunk; dandyprat a puny little fellow; caper-merchant a dancing master and prattle-broth tea. I long for a way to work these into the conversation. This entry was posted in Reviews and tagged Eighteenth century, Historical fiction, Jake Arnott, London's underworld, Sceptre Books, The Fatal Tree on 24 February 2017 by Susan Osborne. 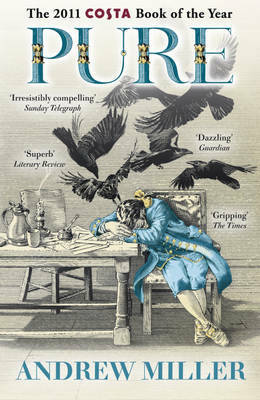 I’ve been circling warily around Andrew Miller’s Costa Prize winning Pure for some time now. 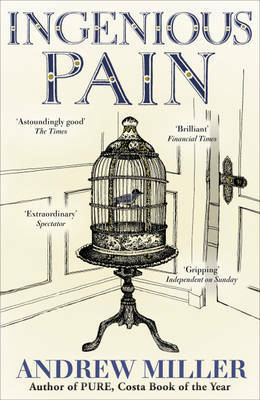 Miller’s first novel, Ingenious Pain, is one of my favourite books. Set in the 18th century, its main protagonist, James Dyer, is conceived on an icy night as a result of an adulterous coupling with a stranger. James cannot feel pain which appears to be a blessing but is, of course, a curse because he’s unable to understand the human condition. He attaches himself to a quack show, is abducted and kept in a rich man’s house as a curiosity, acts as an assistant to a ship’s physician and later, becomes a brilliant but supremely arrogant surgeon in fashionable Bath. His greatest and final adventure is to take part in a race to St Petersburg to inoculate the Empress of Russia against smallpox, and it’s on this journey that he meets his nemesis – a strange woman whose miraculous powers give him the gift of pain. There, just writing that has made me want to rush off and read it for the third time. Ingenious Pain was published in 1997 and every time I’ve got wind of a new Miller novel I’ve looked forward to it eagerly. It’s not that they’ve been bad novels – far from it – but none has matched the magic of his debut for me hence the hesitation over Pure even though several people whose opinions I trust assured me that this one really did hit the spot. I’m half-way through the tale of the clearing of Les Innocents Cemetery in pre-revolutionary Paris and although not quite as smitten as I was by Ingenious Pain it’s a close run thing. As a keen reader of debuts, always on the hunt for new talent, I’ve found that the second novel is often a disappointment. Jake Arnott’s excellent The Long Firm is a case in point. Set in mid-60s London it explores the sinister underworld of gangland London and is written with a wit as sharp as the cut of a gangster’s suit, not too mention sufficient period accuracy to satisfy even my contemporary historian partner. Sadly the next two in the trilogy didn’t cut it for me. 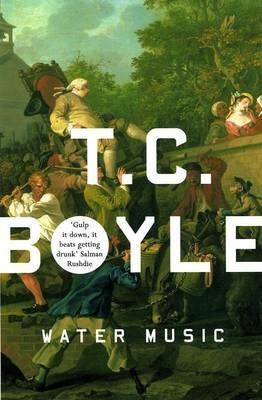 T C Boyle’s Water Music is a rattling good yarn based on the 18th-century explorer Mungo Park’s compulsive quest to find the source of the Niger. It’s packed with extraordinary characters who never seem to have a dull moment and is very funny indeed but my copy of Budding Prospects, Boyle’s second novel, landed up in a charity shop. Of course, it’s not always the case – Kate Atkinson’s Behind the Scenes at the Museum was a joy as is everything else she’s written, and Audrey Niffenegger did a fine job with Her Fearful Symmetry after The Time Traveller’s Wife – but it’s happened enough to make me wonder why given that most of us get better at something the more we do it. Perhaps it’s the rabbit in the headlights syndrome – having laboured away quietly, some times for years, suddenly having so many expectations from both readers and publishers must weigh heavily. Perhaps it’s having the luxury of time to lavish on writing and research the first time around and being rushed the second. Or maybe I’m just being greedy. This entry was posted in Random thoughts, Reviews and tagged Andrew Miller, Granta, Ingenious Pain, Jake Arnott, Pure, Sceptre, T C Boyle, The Long Firm, Water Music on 7 May 2013 by Susan Osborne.